Eleksen's Cloth Bluetooth-Enabled Portable Keypad | OhGizmo! So, picture this. You’re at lunch someplace. It’s a power lunch. You know, the suits, the cellphones, etc. You plop your mobile on the table. Then, the urge to text someone overcomes you. It’s business, it’s okay, no one will mind. What do you do next? 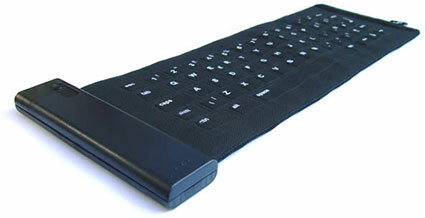 You pull out Eleksen’s portable, wireless, fabric keyboard, natch. You won’t look stupid, I promise. I mean, hey, it only looks like you’re going to be typing into a piece of 100% fabric, water-repellent, super durable black cloth (which you are, really). You’ll push your club sandwich away, put the device on the table and start typing. Bluetooth will take care of the rest. Then, when you’re done, you’ll replace the 2.4oz unit into your jacket pocket, and start chomping down, like nothing ever happened. See, you’re just that cool.